These days it seems like I'm on the every other or ever two weeks cycle with this blog situation. Don't get me wrong, I LOVE blogging, but it really is a time commitment, and these past few weeks I've been go, go, go! It's been super fun, and I can't even complain. Believe me, I tried to complain, and then thought to myself, nope! How can someone complain when they're having as much fun as I am!? I mean how many people head on down to the Ocean Reef Club, sip on some Reef Cups, get a tan on while working on a few things here and there. Then FaceTime to see the cascarones break announcing their bestie is having a GIRL (AHH! ), find out your other bff is getting married, and pull a few slots while on the way to the airport with their biffle. Then work for a couple of days, hang out with their mom a bit, and head to Charlotte for music, whitewater rafting, great food, and fun with their boo? Like the person that complains about that really needs to reevaluate their life. This weekend was supposed to be some more of that same go, go, go, but my body said, "no.no.no." I was so looking forward to the weekend at Foxfield Downs - for all you Texans out there, Foxfields is a steeple chase race that happens in Virginia, think Downtown Abbey - but my body was telling me I might need to slow down and finally get some sleep. I was super bummed when I woke up Friday morning and knew the adult thing to do would be to not go hang out in the wind and rain, eat and drink way too much, and sleep hardly at all for the 3rd weekend in a row. Lucky for you, and all the people going to Foxfield, I didn't have this realization until after I made the Twice Baked Potatoes of a lifetime, Amy, who invited me to this awesome weekend in the first place, served as proxy chef and took them down for everyone to enjoy. Don't worry I saved 1 or 2 for me and the sweetest boyfriend ever (he drove all the way to D.C. from Charlotte to lay in bed, watch Netflix and take care of me). Don't they look yummy? I'm pretty sure I never met a person that turned their nose up to a twice baked potato. How could you? What's better than a salty, crispy potato skin filled with cheesy, buttery, creamy mashed potato topped with more cheese and bacon? That's right, almost nothing. As grilling season arrives (or has arrived for all y'all in Texas) these are a great go-to for that next potluck, backyard bar-b-que block party thing you're invited to attend. I always have to rack my brain for a good, easy, make ahead side to take to things like that, don't you? I mean you can go the salad route, but everyone has their favorite version of pasta salad, you can bring the condiments, but c'mon you're more creative than that! So, give these a try, there one of those potluck items you can make well in advance and you know everyone is going to love them. Seriously, these were going to be eaten on Saturday night, so Thursday when I got home from work, I popped the potatoes in the oven, let them cool, scooped them out and made the filling, then put everything in the fridge. The next morning, I woke up, filled the skins, and put them on one of those throw away pans for transport. Yesterday, Amy and I topped them with cheese and bacon, popped them in the oven until they were heated through and through and the cheese was nice and melty and then everyone chowed down, and I have it on good authority, they were a smashing success. To start this recipe, you'll want to bake the potatoes. 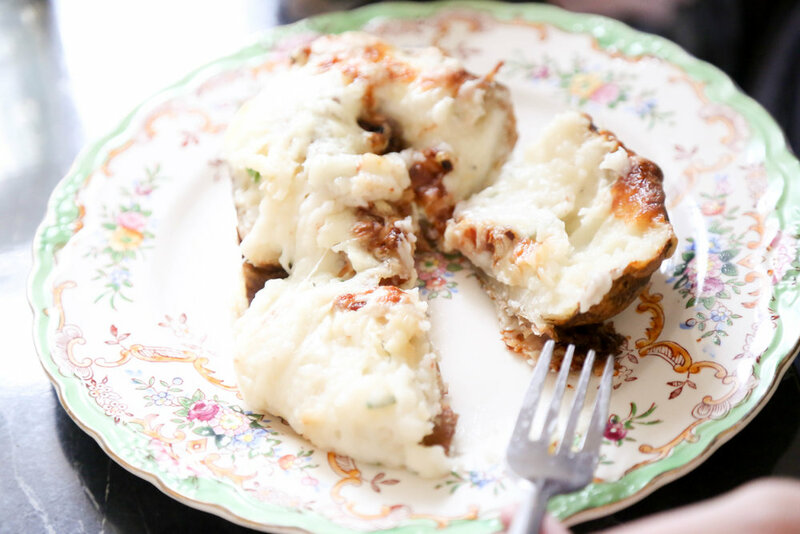 My new favorite way to bake potatoes is so simple, and it makes the inside of the potato so creamy and delicious. You'll want a nice size roasting/rimmed baking sheet. You want to drizzle a fair amount of olive oil on the pan, take your washed potatoes and roll them in the olive oil. You may want to drizzle a little more on the tops of the potatoes and roll them around again. Then, cover the potatoes in salt (corse ground), tops and bottoms. Do Not poke holes! Place them in a 350 degree oven for about 30 minutes. At the 30 minute mark, take the potatoes out, roll them around/flip them, and lay a piece of tinfoil over the tops. Cook for another 30-45 minutes until the insides are nice and tender and the outside is a bit crispy. Let them cool on a wire rack while you gather all the delicious ingredients for the filling. Now you'll want to slice the potatoes into halves, scoop out the inside, and stack up the skins. 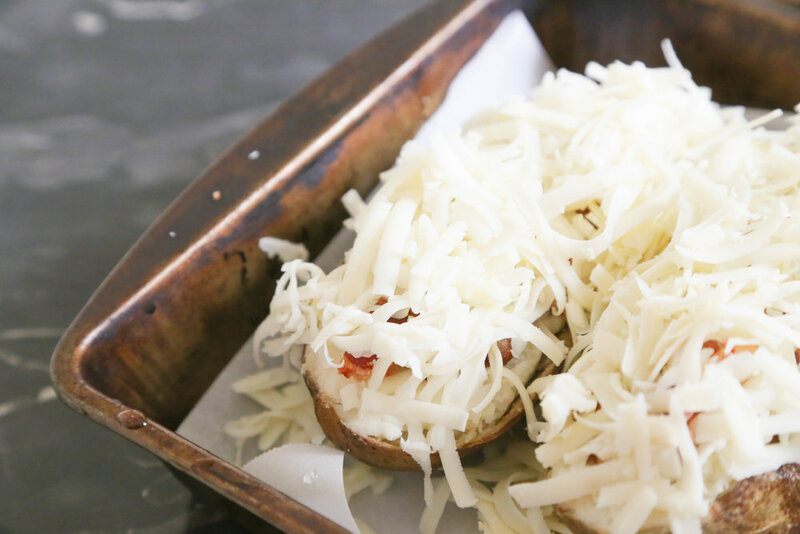 Once you've scooped all of the insides out of the potato skins, you'll want to mash and stir in all the delicious fillings like the butter, milk, sour cream, salt and pepper, and parmesan cheese. If you're going to serve these immediately, go ahead and mix in the chives, but if you're going to put them together tomorrow, hold off on those for now. Don't be shy on the mixing and stirring, the more air you add, the lighter and fluffier it gets. When you're ready to bake them, cover the tops with bacon and cheddar cheese. Yes, there's bacon under all that cheese. If you've add them in the refrigerator over night, you'll want to bring them to room temp before the second bake. Bake them in a 350 degree oven for about 20-30 minutes or until the inside is piping hot and the cheese on top is melted and golden. How could you not want to dive right into these? Step one, bake the potatoes. To do this, wash them well, cover the bottom of a rimmed baking sheet in olive oil, roll the potatoes in the oil and then cover them with course ground salt. Bake for 30 minutes at 350 degrees. Roll the potatoes after 30 minutes and cover with a sheet of tinfoil. Bake for an additional 30-45 minutes or until the potato is tender on the inside. Next, scoop tender, warm insides out of the skin. Be careful not to tear the skin, leave some of the flesh so that the skin is firm enough to sit like a boat. Mash up the tender, warm inside, as if you were making mashed potatoes. Add the butter, mash some more. Add the cheese, again mash it up. Add the sour cream, give it a good stir. Add the milk, stir some more. Add the salt and pepper, and give it a few more good strong turns. At this point, if you're making these ahead of time. Stop, wrap up the skins and cover the filling. Refrigerate over night. The next day, add the chives. Fill the skins with the creamy and delicious mashed potato filling. Cover the skins with bacon and cheddar cheese. Cook the skins until the inside is pipping hot, and the cheese is golden and melted. These will keep uncooked in the fridge for at least 2 days, or you can make a bunch and freeze them and pull them out one by one!